Pet Wants’ specially-crafted pet food formulas are made in small batches with fresh, natural ingredients. Pet Wants SF offers convenient, free, personal delivery to the entire San Francisco Area. 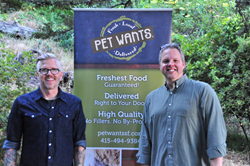 Long-time friends and pet parents Jeremy Horton and Michael Schirmer are pleased to announce the launch of their new pet food and supply business, Pet Wants SF. Pet Wants’ specially-crafted pet food formulas are made in small batches with fresh, natural ingredients enhanced with vitamins and minerals for a complete and balanced diet in every bowl. Pet Wants SF has multiple blends of dog and cat food formulas as well as healing salve, calming balm, anti-itch spray, paw wax and more. Pet Wants SF offers convenient, free, personal delivery to the entire San Francisco Area. “There are a lot of options in the pet food industry, but none of them are like Pet Wants. I think people genuinely want the best for their pets and diet is a huge part of that. Pet Wants offers people a great opportunity to have healthier, happier pets by feeding them a whole food that’s conveniently delivered,” Schirmer said. Horton is originally from Alabama and has lived in San Francisco for the last 9 years. He served in Operation Desert Shield/Desert Storm with the 109 Evac. Hospital and has been a nurse for the last 21 years, including three years as a travel nurse. He has a 6-year-old Shih Tzu named Gracie. Schirmer, who has owned a dog walking business for the last 10 years, moved to San Diego in 1986 and then to San Francisco in 1995. He’s originally from Indianapolis and is a casual marathon runner and cyclist. Michael has completed two AIDS LifeCycles and has an 11-year-old Cattle Dog named Harper. Horton and Schirmer found Pet Wants when Horton was looking for a change. To learn more about Pet Wants SF or to place a delivery order, call (415)494-9384, email JHorton(at)PetWants(dot)com or mschirmer(at)petwants(dot)com, or visit http://www.petwantssf.com.